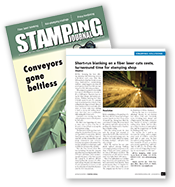 All-New Stamping has been a leading manufacturer of precision stamped parts for the electronics industry for over 60 years. During this time we have seen many changes in the materials used, ergonomics, quality standards, and delivery and tracking methods. This gives us the advantage to better assist you in making the right choices for the manufacturing of your parts. Our team works with you to provide the turnkey services that best match your requirements. Our DFM (Design for Manufacturing) evaluation lets us determine such factors as the most cost-effective tooling to manufacture your part, the best materials and manufacturing methods to get you a finished product that meets your exact specifications. All-New is AS9100 and ISO 9001 certified. This means that your parts will be manufactured to the highest quality standards and delivered on time and on budget. At All-New Stamping, we are your manufacturing partner, working with you every step of the way to provide you with the Power Satisfaction you deserve for all your projects.